In an effort to save my welded 3x fairing system from total obsolescence I turned on my brain for a moment and came up with a very basic idea that I honestly don't expect to work, but I figured it's worth a shot. As will no doubt be apparent in a second, I have no idea how part occlusion works vis-ÃƒÂ -vis aerodynamics, but it occurred to me that it might be possible to occlude parts contained within the fairings by giving the fairing segments a "cylindrical" drag cube equal to the diameter of the stack and height of the fairing segment, and setting the CoM at the centre of the stack. To clarify, take the following image in which the fairing segment shown is the same height as a Jumbo-64 tank, and the stack is 2.5m in diameter. I would give each fairing segment the drag cube and CoM of a Jumbo-64, thereby (hopefully) occluding everything within the fairings, while the nose cone up top would (hopefully) occlude the 3x "Jumbo-64'" beneath. If someone could explain to me why this is destined to fail, I'd very much appreciate it. That just saved me from a lot of fruitless trial and error. *edit: as an aside, how are overlapping drag cubes handled? Not too sure on the drag cubes end of things. I believe a part can only have 1 drag cube assigned at a time, but I'm not sure how overlapping cubes would be treated from multiple different parts; though I think that anything that is radially attached gets full drag applied for its cube regardless of if it is actually clipped in/intersecting other cubes. They don't so much use actual occlusion calculations for drag as far as I can tell; rather it is more node and attach-system based. An uncovered node generates full drag for that face/part, a covered node generates -far- less, though still some. A radially attached part generates full drag for its given orientation to the airstream. Actual clipping and part size-based occlusion is not used; e.g. clipping a surface/radially attached 1.25m fuel tank completely inside of a 2.5m tank will -not- remove its drag in the slightest. Putting -anything- on a node results in the same reduction in drag for the covered node, regardless of the size of part used to cover it (though I believe the different sized parts will themselves have different drag, still resulting in an overall difference to the vessel). If I remember correctly somebodies tests had shown that the best nosecone for nearly anything (from a drag perspective) was the tiny little cubic strut; it had the lowest drag itself (even with an uncovered top-node), and as such is the best suited to cover any other node. 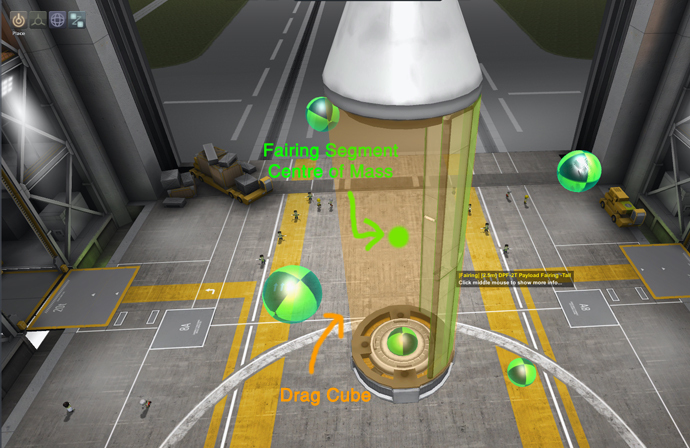 Others would likely know more though; I've tried to stay away from the whole drag-cube system as much as possible. yeesh... sounds as though the aero system is somewhat awkwardly cobbled together. While you could add fake drag cubes to the fairings, the problem is it'll only ever occlude a part stack-attached to it, not parts attached to that first attached part. Occlusion isn't transitive.